Sinivalia is a London based company that I had the pleasure of receiving several products from to test (see post here for the full list). Their products are cruelty free and made from all natural ingredients – meaning they are also chemical free as well! Bonus! 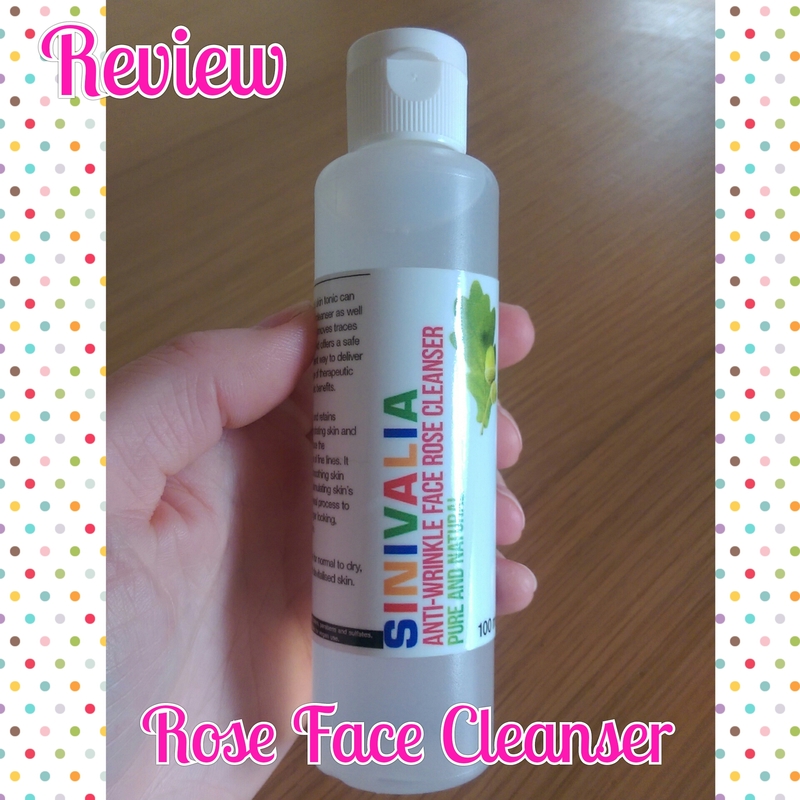 This is the Rose Cleanser – or Anti Wrinkle Face Cleanser – it comes in a 100ml plastic bottle with a flip lid, the ingredients in this are stated as being Rosa Damascena Distillate Flower Water (organic certified ingredient) and this is it – nothing else at all is in this. It states that is good for all skin types as again for optimal results to pair it with other products in the range (I have combination skin, some times it dry and other times it is oily but mainly dry for the time being.) But also says that it is suitable for normal to dry, mature skin and devitalised skin. This beautiful skin tonic can be used as a cleanser as well as a toner. It removed traces of make-up and offers a safe and convenient way to deliver a wide range of therapeutic benefits. Rose adds and retains moisture, hydrating the skin and helping to reduce the appearance of fine lines. It assists in smoothing skin texture by stimulating skin’s natural renewal process to reveal younger looking glowing skin. So what do I make of it? Firstly I loved the smell of it – I immediately thought of Turkish Delight and it just reminded me of a holiday I took to Turkey with the hubby many moons ago before we had kids. I applied a little to a cotton pad and sweep it over my face. I was impress that it did in fact take off my make-up! I did have to use it a good few times before I felt my face was totally clean of make-up and it did kinda struggle with my mascara for some reason but we got there in the end. It did leave my skin feeling refreshed and clean, but I don’t feel it did anything to the little wrinkles on my forehead that I already have that I could see anyway and as to if it would prevent more form appearing in the future I cant say for sure, maybe with prolonged use. It certainly has made my skin appear smoother. As well as using it as a make-up remover I also used it to refresh my skin on those hot sticky days we had recently – not that we get many of those in Scotland – but it certainly give me a quick refresh and not feel so tacky. I would be more than happy to buy another bottle of this when it runs out mostly for the smell, but also for how refreshing it made my skin feel.